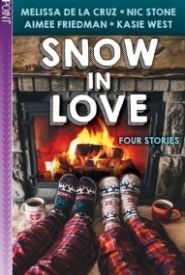 SNOW IN LOVE features four short stories that really get you into the Christmas spirit and they've also added some diversity into the mix. Kasie West's SNOW AND MISTLETOE is my favorite and is so adorable and perfect. When Amalie's flight is delayed, she doesn't anticipating hitching a car ride with a boy from her high school. Sawyer's sister is driving Sawyer and his friends back home so they can make it in time for Christmas. This one got me into the Christmas spirit the most. The second one is WORKING IN A WINTER WONDERLAND by Aimee Friedman. Maxine is Jewish and doesn't feel there's enough Hanukkah during the holidays, including songs. But Maxine wants Christmas love, she gets a job as an elf hoping to get closer to Heath Barton. Things don't always work out how you expect, but it's usually for the best and I love the ending! The third one is THE MAGI's GIFT by Melissa De La Cruz. Kelsey and her boyfriend Brenden are getting ready for the holidays. However, Kelsey struggles on what to decide to buy as a gift for him. Even though Brenden comes from a poorer background, Kelsey doesn't let it bother her. In the end, everything turns out perfect and can I just say that Brenden is the perfect boyfriend. I like that this one was different in the sense that the two main characters were already in a relationship. The last one is GROUNDED by Nic Stone. Leigh knows she likes girls, but isn't ready to tell everyone yet. But when she joins her old friend Harper for a scavenger hunt, she finds that her secrets are hard to keep hidden. This story is my least favorite and mainly because of the texting format. To me, it took away from the plot and the Christmas feeling. Final Verdict: Overall, this is the perfect compilation of short stories to cuddle up under a blanket or by a fire. The romance and Christmas in these stories lifted my spirits! I would recommend it to fans of diversity, romance, holiday stories, and short stories.